New Blog Banner (with code) | Who Are You Calling Crafty? In my free time I went though and completed a new banner. I know what you are thinking “It is just your old banner with photos.” It is but it isn’t, each of those photos is hyper linked to that blog post (Manda Happy Dance Right Now!) and if you move your mouse over the photos the title will show up. So this is a long tedious process but because I never want to forget how to do this I decided to type out a very long blog post (with a code!) THIS CODE WILL GIVE YOU THE TEMPLATE TO MAKE SOMETHING SIMILAR FOR YOU OWN BLOG. Copy and paste this code into Text Edit (Apple) Note Pad (PC) and replace the colored text with your own. 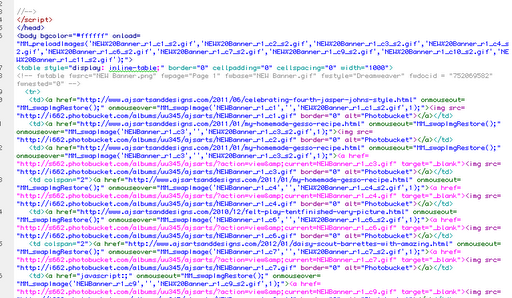 This is a screen shot from Dreamweaver – see the pink? That was the second code that needed to be deleted. Take the photos you just created and upload them to Photobucket (or what ever hosting site you want) and copy the HTML CODE and paste it into your document. Add what web page you would like your project to go to and add a title. Test the links to see if all is well. If everything is good, remove the Page Header and Save. The highlighted HTML coding is the bottom of the banner (on mine it is where the Title is). This is just a screen shot. I did try shrinking the table but I couldn’t get it to shrink with out rebuilding it (sorry). « Semi-Wordless Wednesday Valentines Day Recap!